"Hoping your Holidays are filled with Peace and Joy"
With holly in her golden hair and a violin tucked under her chin, this lovely angel is bringing the spirit of peace and goodwill to all of your loved ones! These cards are sure to be a hit, and are embellished with gold foil. 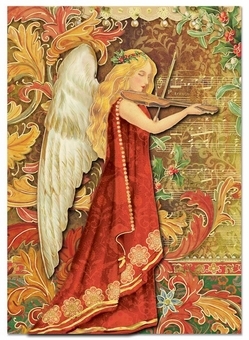 The angel wears a scarlet gown, and is surrounded by music notes and elegant patterns.